Through a series of circumstances, the current online version of "Death of the Honest Men", one of Touhou canon's most debated mysteries, has been proven to be incomplete. Thanks to help from a Touhou fan who has an original copy of the text, the story has now been restored. "Death of the Honest Men" is how some fans refer to the story from the liner note of the first version of "Hourai Ningyou ~ Dolls in Pseudo Paradise". This version was released together with the first version of EoSD at Comiket 62 (August 2002). Both Comiket 62 releases were simply burnt on CD-R, accompanied by self-made liner notes. Due to their historical significance and rarity (only a few dozens of copies are likely to exist), they would have been some of the most sought after Touhou items, if not for that no one is selling them. The way we, the majority of people read this story is by using a transcript circulating on the internet. Unlike the later, mass-produced version of DiPP, the C62 liner note tells a gothic mystery story about eight "honest men". This story, told by seemingly unreliable narrators in a fragmentary, contradictory manner, has always confounded Touhou fans trying to unravel its secret. Now it turns out that one crucial line has been omitted from the existing text. Adding the line back will NOT provide a definite answer to the mystery, but, hey, it is restored. OK, so much for the inverted pyramid. Let's see how it happened! Story time. It started with the new Chinese wiki. They have been producing scans of official game and CD liner notes themselves. Of course, no one has the original copies of DiPP, EoSD or the PCB demo, so photos found on the internet were used, by removing the backgrounds of the liner notes in Photoshop. This is the image of the DiPP liner note produced this way, using a Twitpic photo. One particular Japanese Touhou fan, 塢城 @hk_tk1 noticed this image. Realizing that many characters are faintly readable from the image, he compared it with the internet version, and suspected there are discrepancies between the two. He tweeted about it in the night of November 12, 2014. After some discussion, he and other fans found that, among other things, there seemed to be one small segment in the Track 6 Enigmatic Doll section that's missing from the internet text. The segment with blue underlines is missing. What seemed to be an English sentence at the end of the story. 1) There is another omission in the Track 1 Hourai Legend section. 2) Some lines were indented in the original text (i.e. they have a whitespace at the beginning). These are either inner monologues, or the shrine maiden's diary at the end. There is also a weird whitespace in the Track 10 Reincarnation section. 3) The contact info is practically the same as those in the EoSD manual. Fortunately, soon a holder of the real CD emerged. 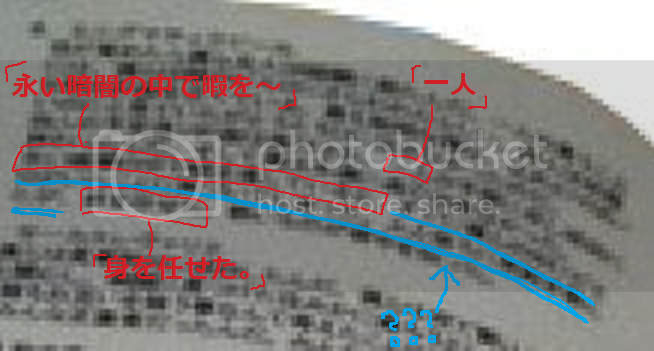 This person has permitted 塢城 to publish a comparison between the real text and the transcript. Aside from the two omissions which are obviously unintended by the transcriber, most discrepancies turned out to be minor typos. 提　いつもならだた苦いだけの珈琲 // Typo in original text. Music Compose/Arrange and Story ZUN // The missing English at the end of the story. The fully restored text, indentation and line breaks included, can now be found on the Chinese wiki. The two most important omissions are marked in red. Also, it has been long rumored, based on the "Interlude" section of the story, that the C62 version has an "Interlude" track not found in the common version. This is not true. 1) Omission 1: in the Track 1 Hourai Legend section, when the curious one received the Jeweled Branch of Hourai, they "could neither move nor make sound, as if my head had been separated from my body". It happens that translators tended to think their head was separated from the body literally. 2) Omission 2: In the Track 6 Enigmatic Doll section, when the clever one was alone in darkness, they "soon realized that the pierro is among us". 3) In the original text, most lines are 26 full-width characters long, with some exceeding it. 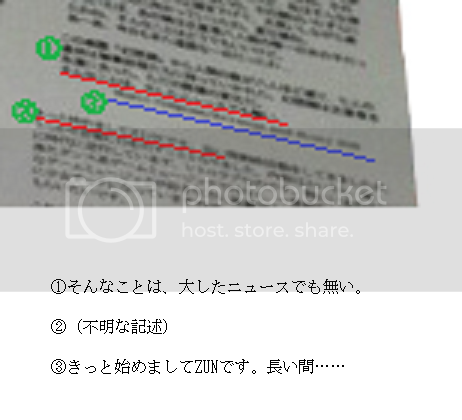 4) Conveying the emphasis dots (placed above or below the characters to be emphasized) has always been a trouble, since this feature, common in Chinese and Japanese print text, is not well supported by HTML. Both the Chinese translator and Kafka Fuura mistook the transcript's emphasis dots for elipses (in Interlude and Track 12 Eternal Shrine Maiden sections). The Chinese wiki currently represent emphases in canon text using bold text. The English wiki's PiDD story (and other places?) uses ruby text. By the way, after this reread, I think "Death of the Honest Men" is a hoax, a fake mystery. It displays the surface trappings of a mystery puzzle, but its pieces can never be fitted into a complete picture. I used to see it as gothic nonsense; now I suspect it is fully intentional gothic nonsense told with a straight face. Any idea what Mokou's spell card might be about (why it exists and/or the symbolism of it and the flavor text ZUN wrote for it) iif that's hypothetically the case? Maybe I'm terribly mistaken but didn't it refer to another person who's linked to Kaguya's story? I think I've read about it somewhere some time ago, and in any case the spell card name is "Honest man death", it's just one person who died. Anyway this is really interesting, thank you cuc! One particular Japanese Touhou fan, 塢城 @hk_tk1 noticed this image. Realizing that many characters are faintly readable from the image, he compared it with the internet version, and suspected there are discrepancies between the two. He tweeted about it in the night of December 12, 2014. It was tweeted in the future? ^ That was a typo, man. I think "honest man", like "hourai", "dolls", and a few other recurring images in the EoSD-PCB-IN trilogy, were just ideas floating about in his mind at the time. Despite both featuring "death of the honest men", the spell card is not deeply connected to the story. For the spell card, the idea is likely "if you are honest and honorable, not cunning enough to figure out the trick, you die", nothing more. It might be better translated "Death of the Honest". EDIT: Of course, unless the idea is "if you are honest and fight the laser head on, you live". Hmm, makes less sense. Re: "honest man": words have no plural form in Japanese. Kaguya punished her dishonest suitors in Tale of the Bamboo Cutter. Mokou's story has Iwakasa. Not sure which the spell card is about. Yeah, it looks like it's just an in-universe scary story, considering that "nailing straw doll to a tree" act was confirmed to have no actual effect in SoPM. Besides, this whole story gives off a strong vibe of a certain Agatha Christie novel, and ZUN seems to be a fan of her works. I'm fine with looking for solution to the story, although I'd like to keep later canon off from the discussion (because they simply didn't exist when this story was written). Before this discovery, it was generally thought that the beautiful one, the only woman of the gang, killed the other honest men. With the pierro confirmed to be one of them, the line from Track 10, "[the mature one] in love of the beautiful pierro, fell asleep happily" seems to support that. If so, the beautiful one being kidnapped by the pierro in Track 2 would be her lie. And the blonde "shrine maiden" in Track 11 is also the beautiful one. But still, who is the person in the Interlude? It is generally agreed that the beautiful one was coerced by the other seven bandits. Who could be the one wishing they return to their bandit ways? How does his, and the cowardly one's actions fit into the timeline? How did he plan to lead his friends back to banditry? The "you" in the Interlude is singular, but this seems insignificant. Looking at other people's discussion following the discovery, they think it's not a given that the beautiful one is unreliable, and the pierro/culprit may be a different person. The "Interlude" takes place before they entered Gensokyo. One of them discovered some way to enter the paradise of Gensokyo. He decided somehow, they could return to banditry and live some sort of new lives after entering Gensokyo. His "finished a task" refers to opening the path to Gensokyo. He waited until the next day to show his friends this path. Upon entering Gensokyo, somehow, perhaps due to her intense hatred, pain and remorse, the beautiful one was "no longer human", turning into a youkai by Gensokyo's magical atmosphere. Using her newfound power, she killed the six bandits who have tortured her for years, while the cowardly one killed himself. She was the only dishonest one, who lied when telling her part of the story. Still, there's no particular sign that the beautiful one is lying in Track 2, other than the fact she survived. I don't find this solution much more illuminating than other solutions, other than the timing of the Interlude. It does fit into what I perceive to be a major theme of Touhou post-2002: finding salvation (freedom) in eternal damnation (becoming a youkai). It was rumored that the said girl is Alice herself. I figured the Mokou thing came from that fiery being in the Dolls in Pseudo Paradise story and the spell card description by ZUN indicated she felt guilty about letting them die. Even then I was always unsure because I couldn't figure out what the fiery being's role was in the first place (I still don't know exactly what the heck's going on in that story). Alice's wooden voodoo technique in BRiJR didn't work because Aya observed her, which broke the spell. At least, according to Alice. So that's not indicative of whether or not that magic is supposed to work. Alice is described in PMiSS as "looking like a doll". The bandits (and thus, the blonde girl) are "Dolls in Pseudo Paradise (Gensokyo)". Alice being stated to look like a doll could be a throwback to the bandits (and thus, the girl) being narratively like dolls. By having Akyuu say "She looks like a doll", ZUN could possibly (again, only POSSIBLY) be hinting, "By the way, that "doll" in Pseudo Paradise? That was her." Alice is a human turned into a youkai through magic training. The surviving girl is a blonde girl turned youkai (from what I could interpret. She was no longer human after all) who somewhere along the line apparently underwent magic training or developing magic (with my belief being that the "magic training" need not necessarily be so formal), since she used that voodoo magic near the end. The story ends in a Western style mansion in the forest. Alice's house is explicitly described as a Western style mansion in PMiSS and is in the Forest of Magic. Alice's dolls are based on various cities around the world from the outside world, so Alice seems to have an odd amount of knowledge or infatuation or memory for it. This is possibly because Alice comes from the outside world, just like the blonde girl and the bandits in Dolls in Pseudo Paradise, whom are also clearly of international mind since they have a party "in a foreign style". Stretching it, but in the end the girl leaves Gensokyo. Alice herself isn't in Gensokyo when first introduced to Touhou but instead is in Makai. So my belief is that the girl leaving Gensokyo could possibly have been Alice heading for Makai. (as a pseudo aside, the shrine maiden at the end is "probably Reimu", per ZUN. Reimu doesn't recognize Alice in PCB despite Alice indicating they clearly met before. Reimu meeting Alice in Dolls in Pseudo Paradise yet not recognizing her in the first Touhou game she appeared in could be a retroactive addition to the running joke.). PC98 isn't "canon" in many regards but that doesn't stop ZUN from having shout outs to it (as shown by Alice herself in PCB), and this could be another case of that. To me, something along these lines was always a clear indication that the girl is indeed Alice. She's known as "seven-colored puppeter", and "clown" is someone you'd expect to wear a very colorful outfit. It always puzzled me why she had a relation to colors since it wasn't evident from just her clothes or profession as a puppeter, but this way it can be a hint at her backstory - or rather that DiPP is a part of it. Lots of words on Alice. You beat me to it! But you had way more information then I knew about but the basic gist of it all. That's what I thought of today while thinking about all of this, it just makes sense. So something I tried to figure out is that when the CD and game she was introduced in came out. DiPP came out 08-11-2002, but oddly when that story came out it was with the re-release of DiPP 12-30-2002. What else came out that day? A trial version of PCB, who had Alice's first Windows appearance! Never mind I think the doll story came out during 08-11-2002 during C62, the new story came out during C63 when PCB trial came out. However I must agree with cuc and say that this story must be a hoax, and the reason why I think that is because it could be a story made to scare people from people who ran away from Alice. In PMiSS it talks about how she is friendly in letting people stay at her house but they tend to run away in fear of her dolls or just how unsettling the environment is around her since she doesn't talk to anyone. I have no evidence but I'd like to believe that those who ran away made rumors and spread and ended up as a story we have in DiPP. It's not the first time the humans in the village have stories that might not be true, in Hina's case they say if even if you say her name or talk about her you will get bad luck/cursed (not sure which), but despite that she does indeed give bad luck when around her there is no evidence that show that even talking about her does that. Either way I love all this talk about that story, it always gave me a strange feeling reading it, I never fully understood it and it felt much darker then the world of Gensokyo that I remember reading about. So something I tried to figure out is that when the CD and game she was introduced in came out. DiPP came out 08-11-2002, but oddly when that story came out it was with the re-release of DiPP 12-30-2002. What else came out that day? A trial version of PCB, who had Alice's first Windows appearance! I did try to remind people in the first post that this Hourai Ningyou ~ Dolls in Pseudo Paradise was published alongside the first version of EoSD. The context: ZUN was publishing doujin for the first time since 1998. He brought one music CD and one game, burnt to modest CD-R discs, with hand-made sleeves. That was what the first versions of DiPP and EoSD were. Re: Alice theory, this has been independently developed more than once in the fandom, and lead to more elaborate theories such as the killing of the honest men comprised a satanic ritual that turned Alice from a human into a Makai demon. Personally I see the DiPP story as obviously self-contained. The beautiful one could be Alice, and hell, it could be Sakuya. I don't find how it connects to other stories interesting. The state of Touhou canon at the time of mid-2002 is like this: in the EoSD backstory, Gensokyo is only a hidden paradise in the mountains, guarded by the Hakurei shrine maiden. When the red mist (which is described as fatal, "even un-normal humans can only last 30 minutes") arised, Reimu's motivation to beat up its perpetrator was that if the mist spread to human settlements nearby, they would come and destroy Gensokyo. The Touhou universe as we knew it did not exist in EoSD and PiDD, per se. Really sorry! That was a lot of reading and I forgot, I was going off of the release date on the wiki. Hey, just because PCB didn't exist when DiPP first came out doesn't mean there can't be any connections. That girl could've been a prototype character that was later morphed into Alice we know. As Tiamat shown, there are quite a number of points that can support at least that much. Thank you all for reminding me it's "Dolls in", not "of"
An addenum: the part of my solution that's probably novel - that Interlude takes place before the honest men entered Gensokyo - was inspired by the backstory ZUN gave about the Prismriver family in an email. The fall of the family was caused directly by Count Prismriver obtaining an artifact from Gensokyo. Viewed in this light, the paradise legend of Gensokyo can also be a seduction that leads to the downfall of ambitious men. Obviously, after graduating from Tokyo Denki University in 1999, ZUN ceased his own doujin activity. His only doujin output during the period was writing the music for the Seihou games made by his younger kouhei in Tokyo Denki University. Anyhow, using the Shanghai Alice name, ZUN applied for Comiket 61, to be held on December 29 to 30, 2001 (Kiougyoku, the second Seihou game was released there). As you know, in Comiket application, most circles except for the few famous ones are chosen by drawing lots, and he was rejected. 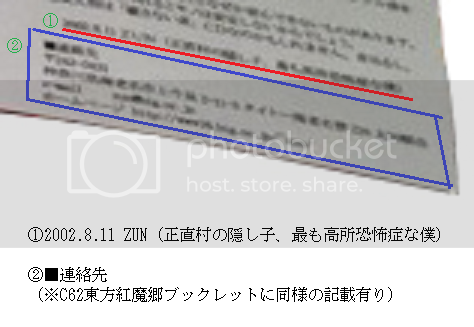 The CD-ROM catalog of Comiket 61 shows that ZUN intended to release music CD(s) that may contain soundtrack or arrange of music from the Touhou and Seihou games, plus new music. According to his site, every song marked as "original" in DiPP was written in 2001. The only DiPP track from 2002 is "U.N. Owen Was Her? ", which was first composed for EoSD. This means what ZUN would have released in Comiket 61 was an earlier incarnation of DiPP, making DiPP the earliest work in the Windows canon, though the fact that "U.N. Owen Was Her?" was added later indicates that the honest men story might also have been written in 2002. After the rejection, he thought about what to do with the long wait until Comiket 62. So he decided to make a game, which was EoSD. At that time, the most famous doujin game developer, or you can say, the Shanghai Alice of that day, was Watanabe Seisakusho, who made doujin fighting games such as The Queen of Heart and Melty Blood. They would later rename themselves French Bread, and become a professional fighting game company. On Sep 5, 2002, Watanabe Seisakusho featured EoSD on its site, with a top page artwork (probably lost now) and glowing praise for the game. This made EoSD known to everyone who cared about doujin games. On Sep 27, 2002, the mass-produced version of EoSD was released to the doujin stores. This was the very beginning of Touhou's popularity. Is mister ZUN still in touch with Watanabe? I currently don't have the DiPP text with me, but I remember that by the time I read it I had a very good reason for how the most beautiful one could fit in the story as the culprit when she was 'killed off' so early. It said something about how the most beautiful one was kidnapped by a clown/pierrot, yes? Later on the rest of the remaining honest men were captured too. I imagine Beautiful put herself together with the other honest men and pretended to also be a victim of the kidnapping. Her vanishing early could also be a good reason for the most wary to already suspect of her before dying with the straw doll's curse. Also regarding the clown itself, I have two theories. One could be that the clown is the beautiful one's maniac/psychopath side which awoke when she was 'kidnapped' by it. The other is that it could be Flandre. Flan has all those Agatha Christie references we are aware of, dresses in Red and White (could be mistaken for a shrine maiden), and is blonde. Also when the most Inteligent one (the one who stayed in the Clown's lair) died, he said he felt something hot against his back. I know that feeling something hot could very well mean he simply got stabbed with a knife, but isn't Flandre's Lavatein depicted as a molten, flaming sword? Just my 2 cents, I'm just happy this discussion is happening after the story has been released for so long!! Oh and about the interlude, I don't remember it very well but I think that it may have been either the most Coward/Reborn cursing himself for being like that, or perhaps Beautiful talking to Coward after he tried killing himself. It is not known if ZUN has ever come into contact with French Bread. When they promoted EoSD back then, it was purely out of love of games, don't be mistaken ;-). Back in 2002, EoSD was extremely polished and impressive for a doujin game, not to mention one almost made by a single person. Oh, whoops, I missed one. Another thing that made me think it was Alice is that her surname is based on a murder mystery (Margatroid), which is what Dolls in Pseudo Paradise is (ZUN gave her that surname after DiPP came out. The surname wouldn't have any meaning if it existed before DiPP). It's pretty rare for surnames to not have some meaning in Touhou, and that was the only one I could think of for why ZUN gave her that name. So basicly Alice is a huge refrence to the dipp story then. As an aside and not too much to really do with Alice (at least, directly), wasn't the murder mystery story only included with the second release of DiPP? The first release instead had all those... weird random quotations. My memory could be off. I believe it was in the first release, which could also explain why this version of translated text was hard to come by. Never mind, we can do this all over again. Even if we are still on the first page of the thread. 2001: ZUN returned to doujin making, applied for Comiket 61 (Dec 2001), was rejected. There are sufficient evidences to prove that he intended to release an earlier version of Hourai Ningyo ~ Dolls in Pseudo Paradise. This version of course, was never released. 2002: ZUN decided he could use the remaining time before Comiket 62 to make a game (the first part in a trilogy), and built EoSD. Aug 2002, Comiket 62: The CD-R versions of EoSD and DiPP were released. This version of DiPP contains the honest men story. Sep 2002: The mass-produced version of EoSD was released via doujin vendors, starting the first wave of the Touhou boom. Dec 2002, Comiket 63: The mass-produced version of DiPP was introduced (along with the PCB demo). This is the version of DiPP you can buy now. Its "story" consists of a series of evocative vignettes. On one hand, why they are so artistically immature and completely separated from the world of Gensokyo. Most of them are rough pastiches of weird fiction that has come before, without much new meaning or creativity. A cursed doll implied to make its owner murder people and take their eyeballs for the doll? An orphan bird man in the circus? Sure sure, been there, done that. On the other hand, why they contained nearly all of ZUN's recurring motifs of that period, from Kaguya and the elixir, to the opium dens of Shanghai Concession, to the idea of youkai living in the modern world. The motifs are all laid bare, yet all undeveloped. If I were the author, it makes no sense to write a fluffy vignette on the body beneath the cherry tree while I'm working on an epic about the same. I can also talk about how the honest men story was clearly written around pre-existing song titles, and how the song titles work better as a loose collection of vignettes than one story. But this is still pure speculation, without any conclusive evidence.